Valamar hotels and resorts in Dubrovnik are located on a narrow peninsula of Dubrovnik called Lapad, on its narrow west side known, and usually called the peninsula of Babin kuk. 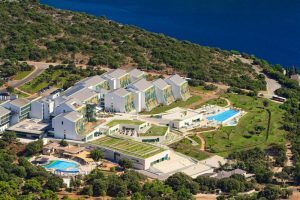 Hotel Valamar Lacroma Dubrovnik – the largest conference venue in Dubrovnik – has been designed to create successful and productive events and boasts specialists in event design, catering, technical production and security. Its main conference hall has capacity of 1300 participants, with additional 7 smaller conference halls capacity from 12 to 60 participants. 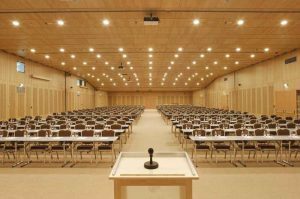 State of the art technical possibilities include LCD projectors, screens, stages, PA systems with microphones and similar equipment needed for successful conference. With up mentioned, Valamar Lacroma offers as well 1000m2 space for exhibitors and poster sessions. Valamar consist of 5 hotels located not more than 1-5 minutes walking distance from each other, categorized as 3, 4 and 5 star hotels. Therefore, they are able to satisfy all types of guests. More precisely, they can provide accommodation and conference services at the same time. Hotels are located only 6 km from the Dubrovnik city centre and have excellent connection with City centre (the Old Town) – cca 10 min. drive on the local bus. It matters not which way you choose to come to Dubrovnik, by sea, by road or by air, one thing is certain: you will want to return here again, and again. Having visited Dubrovnik, the Irish writer George Bernard Shaw wrote: “Those who search for paradise on earth should come and see Dubrovnik”. Unique for its impressive medieval forts, churches, monuments and palaces, Dubrovnik is often called the pearl of the Adriatic. More than a thousand-year old history of Dubrovnik made it a cultural centre of Europe. Initially a small community, the city flourished in no time and became the seat of the independent Dubrovnik Republic. The Republic mastered the art of seafaring and created a fleet on the South Adriatic which could be compared to the one owned by Venice in the north. History is present in the entire city, which is both a museum and a picturesque stage where cultural heritage and contemporary life meet. All houses and monuments have a unique value. The Old City is encompassed by medieval walls, which have been preserved in their original form and opened for visitors as Dubrovnik’s major attraction. In 1979 the City was included in UNESCO World Heritage Site list. When you find yourselves in Dubrovnik and promenade along its narrow streets and squares you will come across a large number of sights. One of the main reasons for visiting Dubrovnik is definitely its warm, mild and dry Mediterranean climate. Dubrovnik is a place of gastronomic delight, and its life in the open air and Mediterranean style are completed with rich and varied culinary choice – the recipes from the past when time was going by more slowly. Oysters (Ostrea edulis) are cultivated in a natural way, and the taste of the sea and sea delicacies has not changed for centuries. Croatia is Central European and Mediterranean country, situated at the crossroads of the Adriatic Sea and the Pannonian Plain. Country is bordering Slovenia in the west, Hungary in the north, Serbia in the east and Bosnia and Herzegovina and Montenegro in the south. There is also a long maritime border with Italy in the Adriatic Sea. Historical heritage, natural beauty and a pleasant climate make up the framework which, together with high quality accommodation, gastronomic excellence and a rich supply of activities and entertainment, enables Croatia to attract the modern-day tourist. 1. If you were to spread a map of the world flat the town of Ludbreg in Croatia would be in the centre. 2. Croatia have the highest number of UNESCO Intangible Goods of any European country together with Spain. 3. On the island of Susak women wear the shortest folk costumes in Europe. 4. World’s first pipe organ played by the sea can be heard and seen in Zadar. 5. The Walls of Ston are the longest preserved fortification system in the world after the Great Wall of China. 6. Nikola Tesla was born in Smiljan, Croatia, and Slavoljub Penkala, the inventor of the mechanical pencil, is also a Croat. 7. Hum in Istria is the world’s smallest town, with a population of just 20. 8. Croatia won the biggest haul of gold medals in Europe (per capita) at the Olympic Games in 2016 in Rio. 9. Croatia is proud with its 11 Nature Parks, 8 National Parks and 2 Nature Reserves. 10. The richest collection in the world of remains of Neanderthals was discovered in Krapina in central Croatia. 11. Hvar is the island with the most hours of sunshine in Europe – more than 2,800 hours a year. 12. Croatia’s Adriatic Sea is one of 3 cleanest seas in Europe. 13. Croatian men are the 7th tallest on the planet. More about Croatia you can find here.